The Front Page 3 widget area in the Imagely Blush demo uses three (3) Genesis – Featured Page widgets to display an excerpt and a featured image, but you may use any content you wish. Page: Select the page you wish to have displayed from the drop down. Image Size: Select the size of the featured image. Our demo use the imagely-featured (640x640). If a smaller image is used, it will be stretched to fill featured image space when aligned to the Left or Right (set in the next step). Our demo alternates between Left and Right for each Genesis – Featured Page widget. The images will display best when aligned to the Left or Right. Show Page Title: Check the box to display the page title above the content of the featured page. 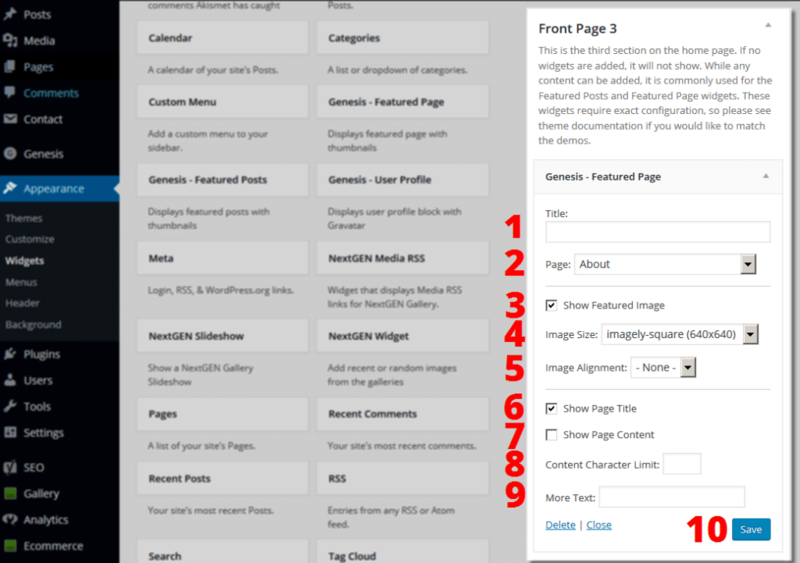 Show Page Content: Check the box to display the content of the featured page. Content Character Limit: To display an excerpt of the page with a Read More button, enter the number of characters you’d like to display. Leave blank to display all the text from the page. More Text: If you are using a Content Character Limit, enter the text you’d like to display in the Read More button that follows the excerpt. This text will automatically become a button that visitors can click to access the featured page.